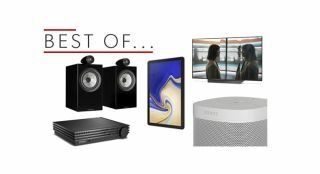 Best of the Week: Sony Master Series TVs, PMC Cor amp, B&W 705 S2 review and more | What Hi-Fi? This week, Sony revealed new OLED and LCD TVs courtesy of its Master Series range, Sonos finally announced support for Google's Assistant would be coming later this year and Samsung announced a successor to its Tab S3 tablet, the Galaxy Tab S4. For reviews there's the PMC Cor integrated amplifier, Sony HT-ZF9 Dolby Atmos soundbar and Bowers & Wilkins 705 S2 standmount speakers. It's also new magazine week, with the September issue of What Hi-Fi? now on sale. Inside you'll find coverage on the latest goings on in the world of hi-fi and home cinema as well as our usual bevy of reviews. We've rounded up some sensational stereo amplifiers and also have an interview with Hip-hop legend Grandmaster Flash. MORE: September 2018 issue on sale now! Sony has a new line-up of flagship OLED and LCD TVs. Dubbed Master Series, the range includes the AF9 and ZF9, the former is an OLED model, the latter an LCD TV with direct LED backlighting. The AF9 will be available in 55in and 65in sizes, with the ZF9 coming in 65in and 75in versions. Pricing is still to be confirmed. It looks as if Sonos has plans in place to support Google Assistant voice control. During a recent phone call with The Verge, Sonos CEO Patrick Spence said integration was due "later this year". Its inclusion will see it run alongside Amazon's Alexa voice control although pricing for Sonos speakers should remain largely unchanged. Samsung lifted the covers off its Galaxy Tab S4 tablet, which replaces the Tab S3. It features a 10.5in Super AMOLED screen with a 2560 x 1600 resolution. There are four new built-in speakers tuned by AKG and support for Dolby Atmos. Also included is a 'refined' S Pen Stylus. It's available from 10th August, with the wifi model costing £599 and the LTE model £649. "If you’re looking for a top-class integrated amplifier, the Cor deserves a place near the top of your list"
Cor is Latin for heart, which makes it an apt name for PMC's first stand-alone amplifier. As the heart of our reference system, the Cor puts in a bold, punchy performance that plays well with all types of music. Factor in the superb sense of timing and excellent dynamics and it's a top-class integrated amplifier that comes highly recommended. "Sony’s latest Atmos soundbar is heading in the right direction"
This isn't Sony's first attempt at a Dolby Atmos soundbar, but it is markedly cheaper. Can it deliver the goods? On the whole, yes. For the money, you get a soundbar that's easy-to-use, with a balanced sound and boasting impressive Virtual Sound technologies. But if you want the true Atmos experience, its more expensive sibling, the ST5000 is a better bet. Nonetheless, the HT-ZF9 puts in a solid showing at a less prohibitive price. "Owning a pair of B&W 705 S2s is like having a sports car on your drive"
The 705 S2s are a beautiful pair of speakers that offer plenty of excitement. They have a sound that's authoritative, weighty and deep, with loads of detail and a performance that's in your face. However, that excitement comes at a cost. Rivals have more subtlety and flexibility, so while the 705s can be thrilling, a slower pace would be nice when required.